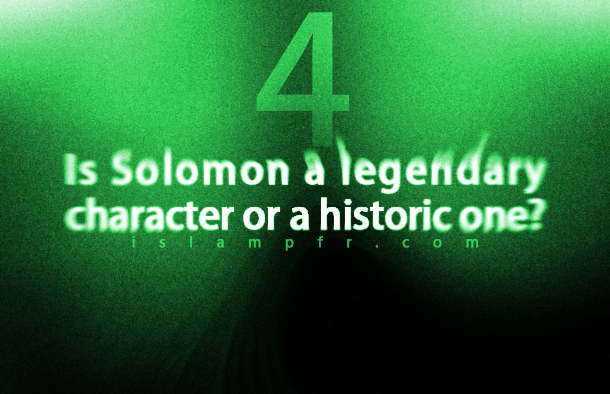 Is Solomon a legendary king or a historic one as a Prophet? 2. Get help from evil for by getting close to him. From the past, some people claim that they had relationships with evils, jinns and souls of dead people. Some people believe these claims. On the other hand, some people believe that these kinds of relationships are impossible and what is said in this regard is a lie or it is derived from imagination or illusion of people who claim to have it. We have some hadiths about magic from our imams. For example, imam Ali (PBUH) said “everyone who knows magic becomes atheist and his relationship with God is terminated” (29). Islamic scholars know magic learning and its usage as a taboo. There is also a hadith from Imam Sadiq (PBUH) that reads: Cane of Moses and ring of Solomon are in Imam Mahdi’s hand (PBUH). Solomon has special respect in The Quran and God knows him as a righteous person and prophet and pure of every sin. The Bible says details about Solomon but The Quran has another way. The genealogy of Solomon in the Bible has made commentators justify different things. On one hand, they know him as son of God and the constructor of God’s house. On the other hand, they know Bathsheba, Uriah’s wife, as his mother. The Old Testament shows Solomon’s government as a kingdom. In the Old Testament, the glory of kingdom, has is depicted in different aspects of Solomon’s life such as competition to gain reign and abandoning the principles. While The Quran knows Solomon as a prophet of God. One of the properties of the bible is its quotation about competitions for accessing to the government and government disintegration after Solomon’s government and the reasons of disintegration. The bible attributes written works to Solomon. The Quran introduces Solomon as a wise man but does not attribute any written books to him.